Today, I bring you another recipe from Serious Eats, which this past week proved an indispensable resource for Amanda and me as we made our way up the West Coast on our own book tour (one of the highlights: The Crumpet Shop in Seattle). 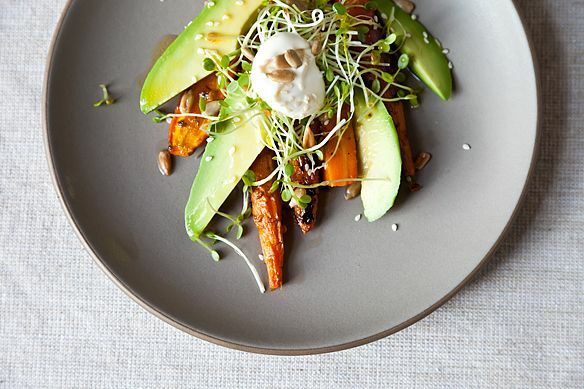 Last week, Amanda extolled the virtues of the cubano mixto, but this time we're going highbrow, with ABC Kitchen's transcendent roasted carrot and avocado salad. We loved the technique of roasting some of the citrus before adding it to the tart-sweet dressing, and the smattering of crunchy sunflower and sesame seeds against a backdrop of sweet, yielding carrot and silky avocado, makes for a textural combination that keeps you coming back for another bite. I made this last week - absolutely delicious! This recipe is also in a Jaime Oliver cookbook, so I am curious which chef actually created it! I made this salad this weekend - so delicious! I didn't have creme fraiche, but had some mild goat cheese that I crumbled on top. All the ingredients come together so perfectly. I will definitely make again. I'm thinkin' Thanksgiving (minus the creme fraiche) for the vegans in the crowd! This looks fantastic; cream (or "creme"), crunch, carrots, citrus - yum! This is one of my favorite salads and one of the reasons I adore ABC Kitchen. I never realized Seriouseats had the recipe, but boy am I thrilled to now have it in my arsenal. Thanks! Probably because the headnotes describe "the smattering of crunchy pepitas." So I don't think it was all in your head! Probably because the headnotes describe "the smattering of crunchy pepitas," so I don't think it was all in your head! Duh. I thought the recipe called for pepitas. What was I thinking? Beautiful. Avocado in, on, or under anthing always grabs me. I've had a problem with buying pepitas and having them be rancid or turn very quickly. Any thoughts on that?